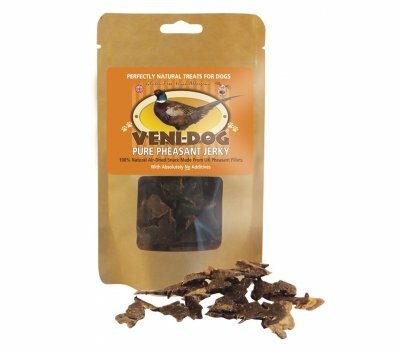 100% natural air-dried treats made from UK pheasant breast fillets (with no offal or other body parts) presented in bite-size pieces, with no additives. Having a unique and rich flavour, these snacks are a super-healthy source of natural vitamins and minerals – especially vitamins B6 and B12, phosphorous, iron, selenium and niacin – but low in fat and calories. Gluten-free, hypo-allergenic, suitable for dogs with food intolerances. This product is naturally air-dried (not freeze-dried) so as to retain all nutrients and flavour for your dog.